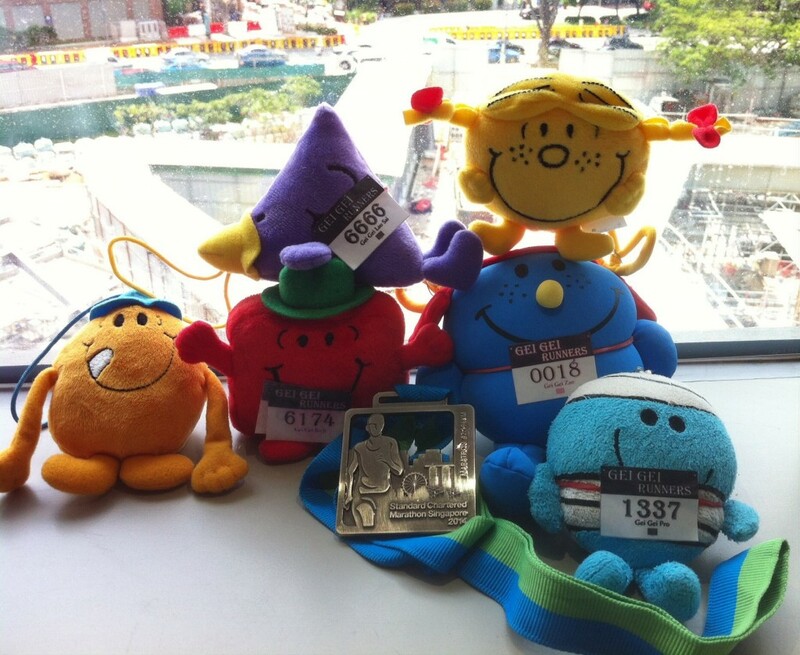 Standard Chartered Marathon 2014 (Half Marathon) | JustRunLah! 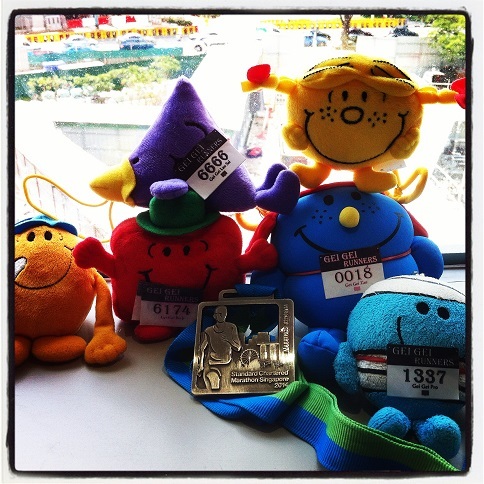 It’s been slightly more than 1 week since the SCMS 2014 – my first half marathon, The Human’s second… and I’m pleased to declare that I AM STILL ALIVE AND BOUNCING! Can I finish in a respectable timing? This is kinda subjective eh? 02:41.40 – you be the judge. And my greatest worry of falling off and getting lost midway? Well… as I’m still here, clearly that didn’t happen. 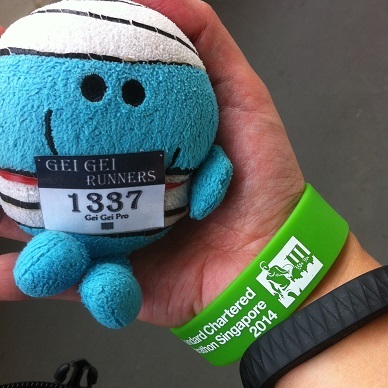 Phew ~ had a few scares though, when fellow runners brushed roughly past The Human and hit me right in the face. 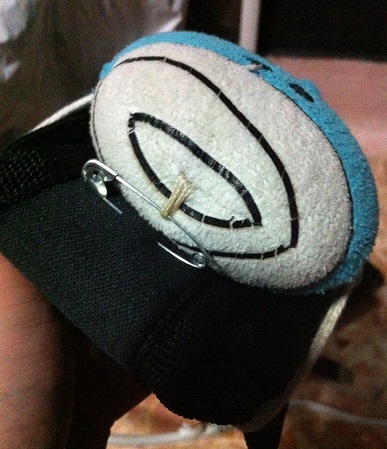 Lucky I was strapped on pretty good, with a safety pin at the top of my head for additional security. This might look painful, but I assure you it didn’t hurt a bit! My day began at 3am, with the annoying sound of the alarm clock blaring. The Human hit the snooze button and only woke up 1/2hr later. After which was the frenzy of having breakfast, worshipping the porcelain God, taking a quick shower, then scooting outta the house. Rushed home to take her wallet, and that genius decided that she would take a cab down instead – totally forgetting about the numerous road closures. The Human hitched a ride with 3 other half-marathon participants who she spotted trying to flag a cab in the same area. If you guys are somehow reading this, thanks a million for the ride! To cut a long story short, she was late. And after being “stuck” a little at the baggage deposit, she flagged off in the second wave as the sun started to rise over the horizon. Save for festive countdown parties, I have never seen so many people at one place before! Spirits were high, and the energy was fantastic as the surge of runners set off, crossing the starting line… and I can’t help feeling curious about the stories everyone has/and will have to tell. Their reasons for taking part, the motivation that got them outta bed at that ungodly hour, the race experience they are gonna have… etc. 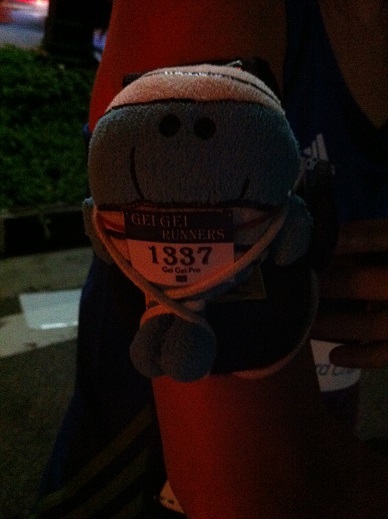 The first half of the race was good. The Human wisely stopped at every water point she came across, and popped her 1st energy chew at about the 7km mark (she can’t bring herself to consume those icky gels). 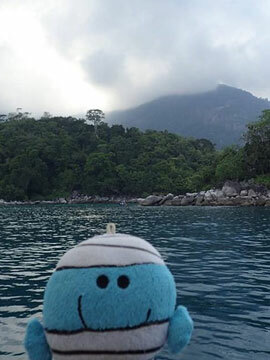 The first hint of trouble came around the 14-15km mark when The Human went up the West Coast Highway. By then, the sun was starting to scorch, and the slopes were taking a toll on her. I could feel her mental fortitude starting to waver, and prayed that she would not break. She soldiered on, like I knew she would. 16km. The Human’s left knee started to bother her, causing her to slow down to a walk. She pretty much did that for the next 2-3km, walk-jog-walk-jog, popping chews occasionally, glancing down at me to ensure that I was still strapped on and patting me on the head now and then. 19km. The end was near, and she has crossed into familiar territory (the CBD area is where she works & runs). By now, The Human has resigned herself to walking… or rather, limping, the rest of the way. 20.5km. 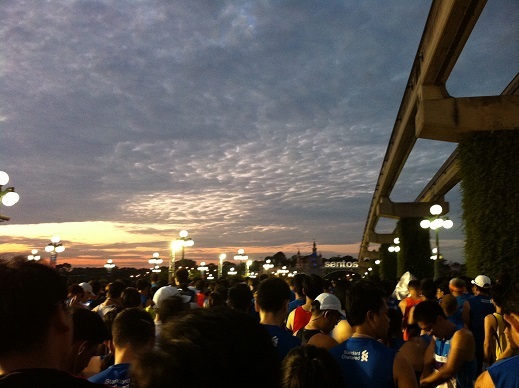 The Human could see the 10km runners coming in from the other direction, and she could feel the energy emanating from the finishing line. She pushed herself forward and successfully managed to jog the rest of the way despite hurting. w00t !!~! The Human’s ordeal was not over though. She still had to collect her baggage. At the Marina Floating Platform. Ugh. This is my only gripe about the event, to be honest. The poor thing limped all the way there, then all the way back to meet up with the rest of the gang. Our “day” ended with a hearty meal at the Marina Square food court, where we chatted about our experience and monitored those who we know are still running via the SCMS app. Don’t be late again, i don’t want to wait for you, i am Mr Rush!!!!!!!! the human should’ve shaded you from the sun …. oh btw, the Gei Gei Mata knows who this human is now ….